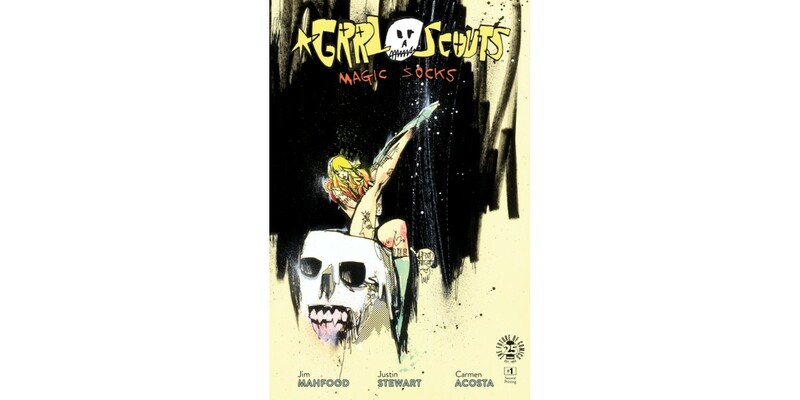 Jim Mahfood (Tank Girl, Clerks) hits big with his glorious return to the beloved GRRL SCOUTS in MAGIC SOCKS. In order to keep up with the increased demand, Image Comics is pleased to announce that GRRL SCOUTS: MAGIC SOCKS #1 will be fast-tracked to a second printing. In GRRL SCOUTS: MAGIC SOCKS, readers meet up with Gwen, Daphne, and Rita as they reunite for a pulse-pounding psychedelic adventure through the streets of Freak City. This first issue is stuffed to the gills with an action-packed story, bonus art, soundtrack, sketchbook, and behind-the-scenes bonus content. GRRL SCOUTS: MAGIC SOCKS will remain available for purchase across all digital platforms, including the Image Comics website (imagecomics.com), the official Image Comics iOS app, Comixology’s website (comixology.com), iOS, Android, and Google Play. GRRL SCOUTS: MAGIC SOCKS #1, 2nd printing (Diamond Code APR178670), GRRL SCOUTS: MAGIC SOCKS #2 Cover A by Mahfood (Diamond Code APR170812), Cover B by Sienkiewicz (Diamond Code APR170813), and Cover C Pride Month (Diamond Code MAR178610) will be available on Wednesday, June 21st. The final order cutoff deadline for comics retailers is Monday, May 29th.